This versatile & potent stretch mark oil has been formulated with herbs & nut oils to boost your skin's elasticity and prevent stretch mark scarring on your hips, buttocks or belly. 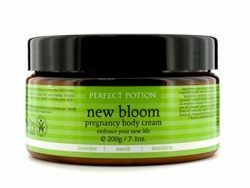 Organic & natural, this oil primes essential body parts for the imminent stretching effect of pregnancy and childbirth. Midwives promote Artemis Oil to increase suppleness and elasticity of the skin to reduce tearing during childbirth. This same property will also protect your skin from stretch marks. Superb organic therapeutic herbal & nut oil ingredients provide this oil with many beneficial uses. It is excellent for use during perineal massage to protect you from vaginal tearing during birth or used after birth to help repair any damage from your labour/episiotomy. Make sure to have this Mother & Baby massage oil in your hospital bag, or on-hand for your home birth! Your skin is like a sponge, especially so during pregnancy. Do not compromise on quality and use only natural skin care products. Artemis Mother & Baby Massage Oil is made with natural plant oils and does not contain petrochemicals or mineral oil making it absolutely safe, for both baby and you. St. John’s Wort (Hypericum perforatum oleum): Enhances the elasticity of the connective tissue and reinforces the skins natural function to stretch, preventing stretch marks and perineum tearing. A unique characteristic of St John's Wort is that it helps to ease tightness in the growing muscles and provides soothing warmth and comfort. St John's Wort Oil has been shown to help ease & repair nerve damage that can occur during birth to the vaginal tissues. To prevent & treat stretch marks, from early pregnancy, apply 2-3 times daily to abdomen, hips and breasts to keep skin supple and hydrated. For perineal massage apply to perineum twice daily, 6-8 weeks before birth. Ask your midwife for instructions. Apply daily after birth to help with healing of any nerve or tissue damage. For Cradle Cap, massage onto baby's scaly scalp, leave for 2 hours then gently comb.